It’s taken me a while to write this review of The Thin Place not because I have been putting it off but rather because it’s taken me a while to read The Thin Place. Unfortunately, Kathryn Davis’ novel is one of my least favorite I’ve read from my mom’s list. It didn’t help that I read such short sections at a time that I frequently lost track of who was who and what was happening. But more than that I think my problem with the book is just that it is a little too out there for me. Chapters would jump around from plot to the thoughts of various animals to reflections on nature. I get that the author was trying to make the point about how all of the universe is connected and the line between life and not life is a “thin place,” but I am too much of a concrete person for these asides to mean much to me. As I often do, I wonder what my mom would have thought of this book. And that is the one downside of being done with The Thin Place. It means that there is only one book left on the list. And while I am excited to complete this undertaking, I think it will be a little sad to be done. However, that does mean that I will get back to reading books of my choice (or really, probably, more books for work). So at least hopefully that means I will be reading faster and more. I have been the worst blogger lately and I don’t even have a good excuse. I’ve finally finished reading a bunch of manuscripts for work (and by finished, I mean finished for now…) so I am actually heading back to my mom’s list. Only two left! Have I mentioned that once or twice or ten times yet? The Thin Place by Kathryn Davis arrived on my doorstep/in my mailbox a few weeks ago and I will be cracking it open this week. That is when I’m not reading the Haggadah for Passover. While the book sounds a little strange to me, I’m looking forward to crossing another one off my mom’s list. I can’t believe I started this project more than three years ago and now it’s slowly (very slowly) coming to an end. I also need a new audiobook to listen to. Any recommendations? I didn’t do a whole lot this weekend. That is, unless you consider catching up on over a week’s worth of TV “doing a lot.” I’m guessing you don’t. However, I did do a little literary purchasing. 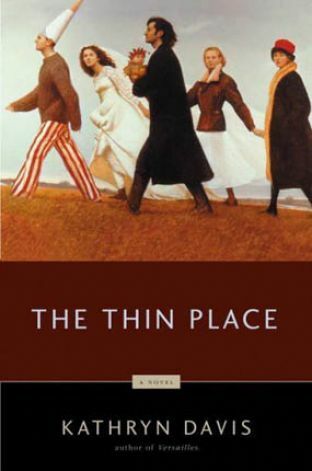 For one thing, I finally bought a copy of Kathryn Davis’ The Thin Place in paperback. I bet you were beginning to think I’d given up on finishing my mom’s list and with only two books left too. But, you see, it was a New Year’s resolution to finish in 2013 so why rush? I didn’t want to peak too early. In reality, I have just been focusing on reading books for work (okay, and Defending Jacob). But in just 4-14 days I will have The Thin Place in my possession and can start it whenever I want. I’ve also been on the hunt for a new audiobook since finishing Billy Lynn’s Long Halftime Walk. Yesterday I decided on listening to The Great Gatsby. It’s a classic. Plus, with the movie coming out in April and the fact that I haven’t read it since high school, I figured it was time for a little brushing up. There were a few versions to choose from so I went with the one narrated by Tim Robbins because, well, because I’ve heard of him. Regardless of who is narrating, I will probably be picturing Leonardo DiCaprio since he stars in the movie and who doesn’t want to picture Leonardo DiCaprio on a regular basis? The prize-winning author of Versailles tells the story of a small New England village unsettled by a young girl’s unearthly gift. In Varennes, a town near the Canadian border, three girls come across the body of a dead man on the local lake’s beach. Two of them run to get help, but twelve-year-old Mees Kipp stays with the body and somehow, inexplicably, brings it back to life. Her mysterious gift is at the center of this haunting and transcendent novel. Sounds weird, but if my mom wanted to read it, I’ll read it. Now comes the part where I have to get a copy. This might be the perfect time to break out my library card (finally!). I’ll keep you posted. In the meantime, I’m reading a book for work that I’m really liking. I’ll tell you all about it soon!